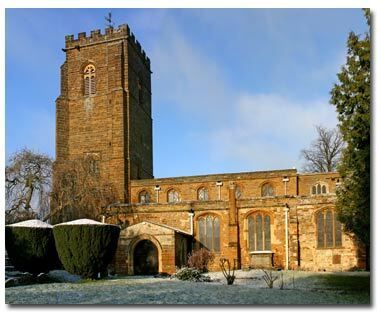 The parish church of St Lawrence is situated in the centre of this historic market town on the site of a Roman public building dating from A.D.120 - 400. Until 1539 the parish was included in the Medieval Diocese of Lincoln but it is now in the Diocese of Peterborough. St Lawrence is a large ironstone church. The oldest portion of the existing church is in the style of Early English architecture, about 1200. The eastern part of the chancel, with the crypt, is in the Decorated Style. The tower and aisles were commenced in the reign of Edward IV (1461 - 1483), and completed in the reign of Richard III. The St. Lawrence section of the web site was researched by Liz Davies. The web editor was David Wilcock. Acknowledgements and a full list of sources can be found by clicking on Sources. This page is from the Towcester and District Local History Society website.